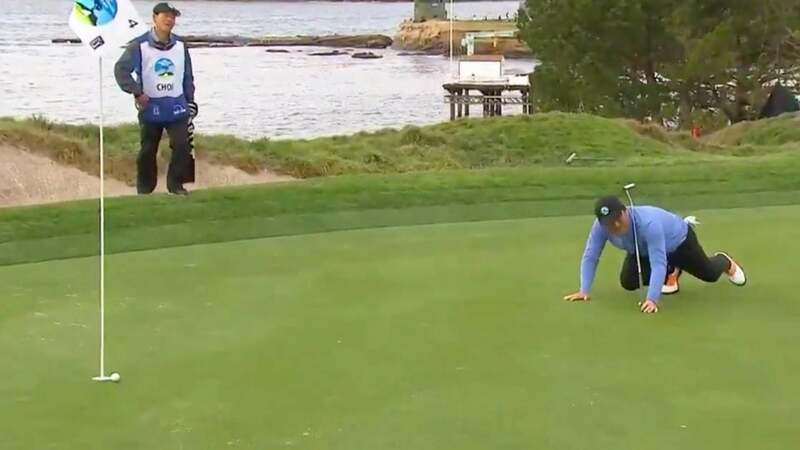 Hosung Choi crawls after his putt during the third round of the 2019 AT&T Pebble Beach Pro-Am. Hosung Choi made his much-anticipated PGA Tour debut this week at the AT&T Pebble Beach Pro-Am. His unique on-course demeanor was on full display Saturday, when he crawled across the green after a failed birdie putt at Pebble Beach. Choi was playing the oceanside fourth hole at Pebble during the third round, when his approach shot set up a 25-footer for birdie. He gave it a great roll on a perfect line, but his ball halted right on the edge of the cup and refused to drop. As good as the putt was, Choi’s theatrics were even better. After striking his ball, Choi flung his arms open, gesturing for the putt to go in. Then, as the ball began to approach the cup, he got onto his knees and began to crawl after it. It was a strange sight on the PGA Tour, but it was entirely expected coming from the Korean golf sensation. Choi’s untraditional on-course behavior has as much to do with his newfound fame as his acrobatic golf swing. But Hosung loyalists should soak up as much of their favorite pro’s play while they can, because he won’t be teeing it up again on Sunday. Through five holes in the third round, Choi was at five over for the tournament, seven shots below the cut line. As of now, he has no announced PGA Tour appearances on his schedule, though it’s easy to imagine him being offered additional sponsor exemptions into Tour events as the year progresses. As far as the fans at the Pebble Pro-Am are concerned, Hosung has been a roaring success and a big draw at an event filled with them. He deftly balanced an unofficial hybrid role as official tournament competitor and celebrity pro-am participant yucking it up with the fans. If he made some noise with his play during a Tour event, it could quickly turn into must-see TV.